If you want to spend your ski holidays in the Ahrn valley, the Alpine Chalet Niederkofler is the right choice for you. We also warmly welcome you in the winter months in St. Johann im Ahrn valley, where you benefit from a privileged position in the middle of the Zillertal Alps and are close to three top ski resorts. Pack your skis or snowboard and visit us in beautiful St. Johann, which is quickly and easily accessible by car, train or airplane. Our apartments are ideal for skiers and winter fans. The two ski resorts Speikboden and Klausberg are both only 4 km away from St. Johann, while the Kronplatz ski resort is about 25 km away, so you can start right after breakfast. A storage room is available for your skis and other equipment, when you come home at night. If you want to recover from a day on the slopes, you can do it in our hotel-own wellness area with sauna and relaxation room. While you relax, your children can have fun in our palyroom with a climbing wall, toys and reading corner. Here with us five modern and comfortable apartments for up to six people wait to be purchased by you. Of course, the apartments are equipped with everything you need to feel well during a ski vacation in Ahrn valley. All apartments have one bedroom, a living room with sofa bed and dining-kitchen and a bathroom. Kitchenware, linens, safe and internet connection are available in each accommodation and on request you get extras such as an extra bed, a high chair for children or a kettle and toaster. Our bread service delivery completes the offer. In Speikboden ski area, in Klausberg and Kronplatz ski resorts you enjoy pure winter fun! 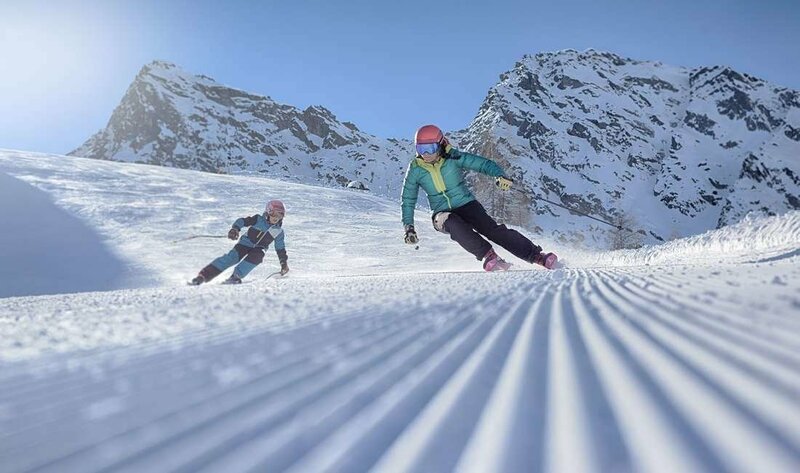 The Klausberg ski arena is suitable with its 30 kilometers of slopes for both professional skiers and beginners, delighting snowboarders as well. Little skiers can learn at the ski school and make first attempts in Klausiland. Here there is a ski rental, if you do not have your own skis. Even the Speikboden ski resort enchants enthusiastic winter fans with 38 km of slopes, seven modern lifts, a fun park and the children’s ski school. In both ski areas you also have the possibility of winter hiking and snowshoeing or tobogganing. With a total of 116 km of slopes and 32 modern lifts Kronplatz is one of the top winter sports destinations in South Tyrol. Long valley ski runs for long, cozy swings as well as the “Black Five”, the five black runs, which demand full skill also from experienced skiers, grant an unadulterated winter fun on and off the slopes. Ski tours in Ahrn valley are possible on different routes, for example, a tour leads to the Gornerberg, while another one, more demanding, leads to the Rauchkofel. Cross-country ski tours can be found among others in Kasern, Weissenbach, Rein in Taufers or Mühlwald, and if during your winter holidays in the Alps you just want to enjoy the winter wonderland, book a ride on the sleigh! 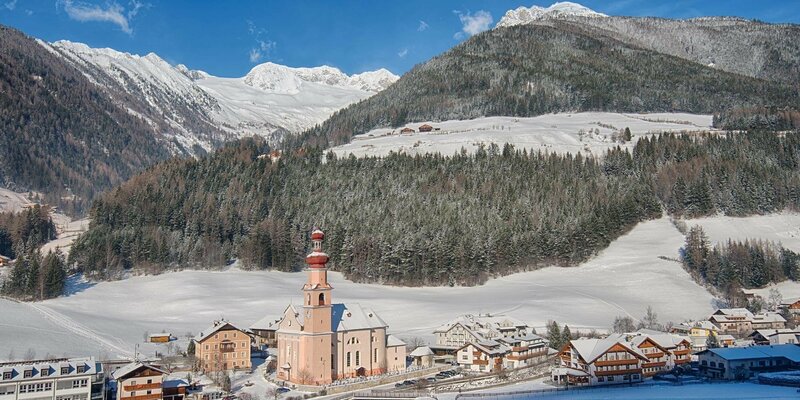 If you spend the winter with a ski holiday in Ahrn valley, you can also experience the Advent in South Tyrol at its best. On no account you should miss the traditional Christmas markets, which take place every year in Bruneck and Sand Taufers! The Christmas Market in Bruneck attracts with romantic ambience, culinary delights and traditional crafts. In Sand in Taufers you have two opportunities to get to know the Taufrer Advent. In the Christmas House with Christmas market in the Doctor Villa you can shop at the stands and sample tea and cakes, while at Bad Winkel in the romantic Christmas magic forest you can enjoy a hot mulled wine in front of a crackling fire, and listen contemplative Christmas carols.